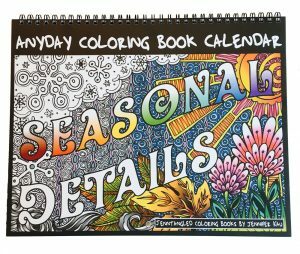 Journey and color through the year with Seasonal Details Anyday Coloring Book Calendar. This dateless calendar allows you to write in your own dates, which means it can be started any day of the year. It’s size is 8.5 X 11, printed on high quality acid free card stock perfect for colored pencils or markers, and spiral bound to lay flat for the ideal coloring surface. Idaho artist, Jennifer Kau, combines line work and black contrast to create a coloring experience like none other. 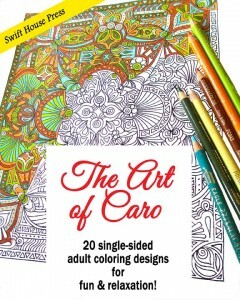 The Art of Caro adult coloring book contains 20 single-sided original designs by the artist, Caro. These coloring pages are intricate and detailed, elegant and sophisticated. 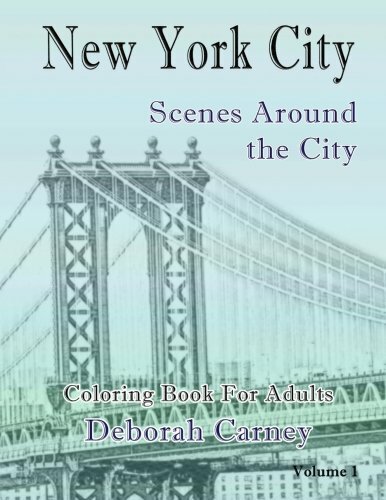 Each complex and intricate coloring page has been hand-drawn by the artist, which means no computer vector graphic software has been used. These pages will provide you with hours of fun, creative satisfaction, and meditative relaxation. Inside this book Caro also shares with you the language of color and how to choose your color palette, how best to use her favorite medium, colored pencils, and 10 Tips and Tricks. Caro is multi-media artist and designer, Carolyn V. Hamilton.